A week of tasty grub. Well I have to say it has been a good week food wise. 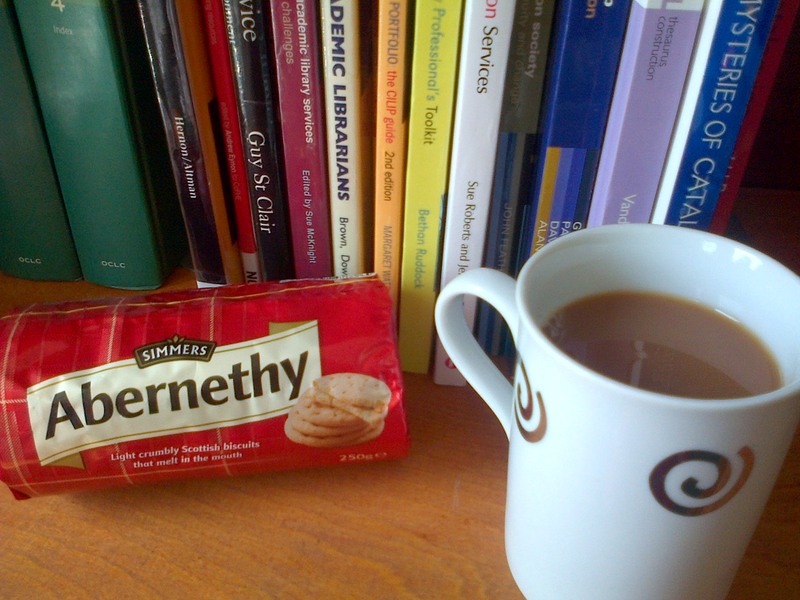 For my tea break today I have Twinnings salted caramel green tea and Abernethy biscuits. So a little bit good and a little bit naughty. Something I realised a long time ago is that I have a sweet tooth and trying to cut out all the naughty things I love always backfires. The Boyo sincerely hopes that any future children of ours do not inherit this, however it runs through the whole of my Mums family and I’m not nearly as bad as I used to be! When I was leaving school we had a yearbook made up and a wee blurb was written about all of, mine included ‘emergency dashes to the vending machine for chocolate’. Not much has changed! So this week as part of my attempts to become motivated and enthused again I decided to resume the challenge I set for myself in 2012. The challenge: I have to attempt one new recipe a week. It can be anything, cakes, treats, main meals etc. but I found it very enjoyable, it makes use of my large recipe book collection, I gain skills by experimenting and practicing and most of all I get to try new things. This included salmon and spinach as well as a lot of cake in 2012 so it isn’t all unwholesome. 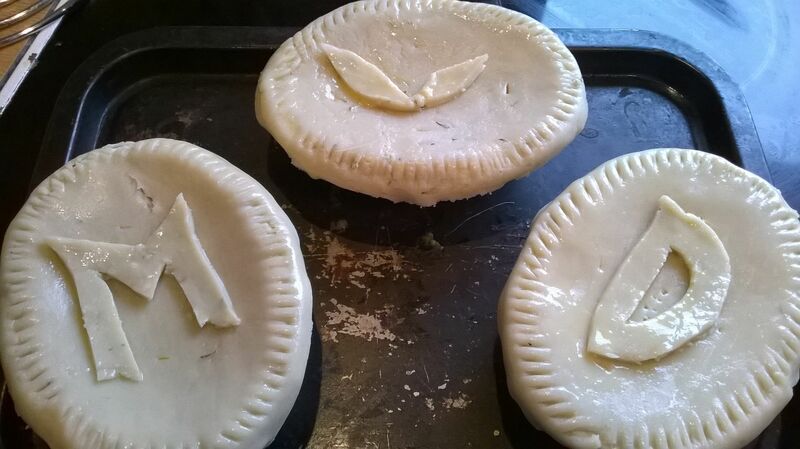 So last week I tried out a recipe from BBC Good Food. It wasn’t the usual magazine; it was a Healthy Eating spin-off. I won’t copy the recipe here as that would be a breach of copyright (I am a librarian!). 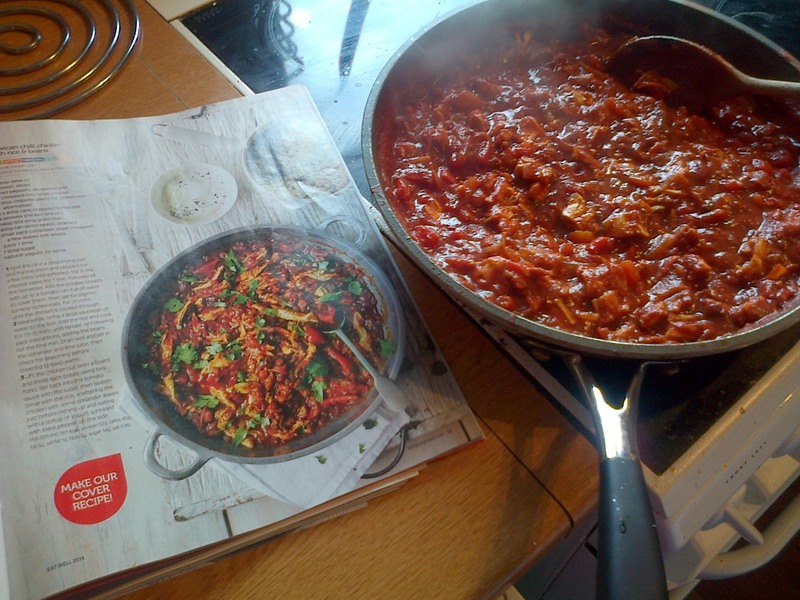 But it was a healthy chilli chicken recipe. If you do find the recipe then I found chipotle paste in tesco but I used a lot of the small jar they sell so I would look for a larger alternative so it would last longer. I made a slight alteration to the recipe; I used passata as both Boyo and I prefer that to chopped tomatoes and it worked out great. Follow BBC Good food on twitter @bbcgoodfood and find other tasty Mexican recipes on their website. On Friday we had a proper treat, I often make something a bit more naughty on a Friday, such as my smoked haddock pasta. This time it was enchiladas. Please note this is my version, I know it is in no-way authentic and it does contain cheats (oops!) BUT it is tasty and my sister demands I cook this every time she visits, in fact sometimes she visits not to see me but just to get fed, nice to know my food is loved. About 150ml of boiling water. a large oven dish, one such as this. I have a big glass one I use. You basically want it big enough to fit the rolled tortillas in but small enough that they will be slightly squashed together as this stops them from unrolling. 1. Put the oven on to warm up at around 200c. Cut the chicken into smallish chunks. Warm a little oil in a frying pan over a medium flame. Cook the chicken and sprinkle over the spices. Remember the more you use the spicier the final result. I often add a few chilli flakes as well and if you wish look at the ingredients on the packet of spice and add more of the individual spices to add more flavour if you have them (eg. Garlic, chilli powder, cumin etc.) As you cook the chicken break it into even small chunks. It is a good way of checking to see how cooked it is and for the wraps later you want small pieces. 2. Pour the passata into a bowl and add some hot water. You don’t want it too thin so add the water slowly, stirring until the sauce is a nice consistency. Then add spices, the same rule as the chicken. The tomatoes neutralise the spices a bit so I’d add a fair bit. I’d say the whole sachet if using one of the sachets of spices (Old El Paso for example) or the equivalent. I know this isn’t very exact but for this you have to go with instinct and play around until you get it right according to your tastes. It is kind of fun, just be confident and go with it. Stir away until spices are mixed throughout. 3. Once the chicken is cooked get a ladleful of the sauce and a sprinkle of the grated cheese. Pour this over the chicken and leave to simmer on a low heat as you prepare the rest – think sticky sort of consistency for the sauce and chicken. Most of the sauce is for the top later. 4. Cook the rice according to instructions (usually 2 min), once it has cooked swap and put the tortillas on a plate and microwave for about 30 seconds. Meanwhile put the rice into a bowl. 5. Now we have all the components we are ready to construct. In a tortilla put a tablespoon of rice, then a spoonful of chicken, a sprinkle of cheese. Wrap then place into the dish, nice and firmly at the end. Repeat until the dish is full. 6. Pour over your sauce. Then as much cheese as you like over the top. 7. Place in the oven for 15-20 min, until the cheese has melted and you can’t wait to eat any longer! Everything has been cooked so it really is just about your patience at this point. 8. Serve. 2 tortillas each person. You will be stuffed at the end. Other notes: This also makes super tasty leftovers. I always make one extra each for the Boyo and I and we have it next day for lunch. It feels like a real treat. You just microwave a portion for 2-3min. For vegetables I usually quickly fry some onions, peppers and mushrooms in a bit of the fajita spice to have at the side. There is no room for them in the wraps. The Boyo really likes some jalapeno peppers with his. Thinking about them makes me hungry! Enjoy. My oh my it has been a while since I blogged. The Boyo and I have been busy bees. The end of term (we both work in FE/HE education) always arrives far quicker than you anticipate. I’m always filled with this idea that once the students have gone I’ll so much more time to get on with my huge to do list. The reality is my to-do list gets even bigger and meetings, training etc. 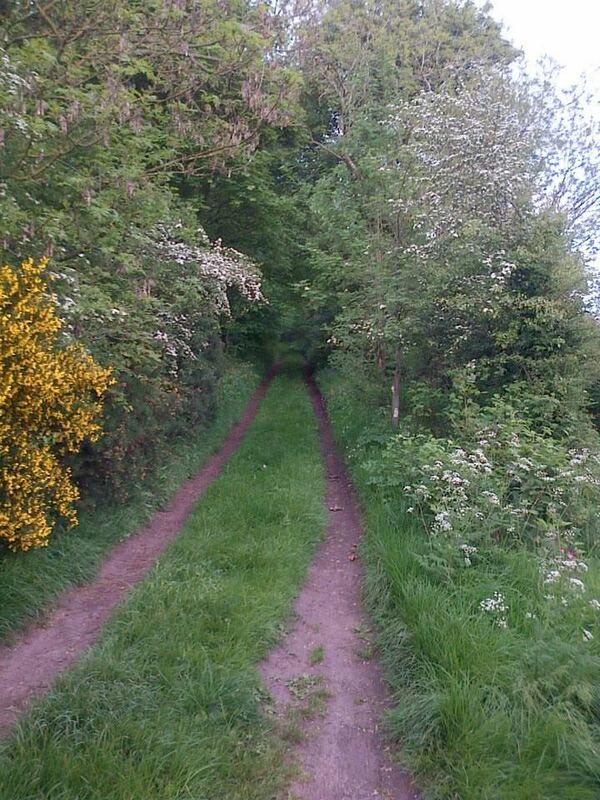 is always hurriedly squeezed in before everyone goes into summer mode at the end of June. The annual CILIPS conference was on as well and I was luckily able to attend the Monday, so it really has been a busy couple of weeks work-wise. Many of our staff are term time only so I have to try and get as much information from them before they disperse and my aim is always to try and get everything magically done before they return in August. This never happens but it is good to have good intentions, yes? We’ve also had Boyo’s family visiting, including their gorgeous dog who was actually staying with us for a week. I miss our walkies and her lovely velvety soft ears. I am definitely still broody for a dog of my own but I also know that with our work schedules it just wouldn’t be fair. Luckily the Boyo was able to take some time off whilst they were here and he got lots of walks with the dog – including 2 Munros, and I was able to join them at evenings and the weekend. So we’ve enjoyed some really lovely walks around our village, Dunkeld where the Boyo’s family were staying and Loch Leven. Unfortunately the weather was pretty mixed and the poor dog got drenched everyday of her stay. We also have had some nice opportunities for tasty treats – cake and tea at Spill the Beans in Dunkeld, scones at Scone Palace – excellent, very good indeed, almost as good as my Granny made them, lunch at House of Bruar one day and a tasty takeaway from our local Chinese takeaway. I did some cooking at home as well, I made enchiladas one night – I’ll post my recipe/method in my next post. It is a bit of a cheat but a huge hit whenever I make them, especially with my sister who visits me regularly just to get fed these. I also made chocolate and vanilla loaf cake and one night we had 3 course with everything made by scratch by me. Vegetable and Coriander soup with homemade bread, Roasted Chicken breast with garlic mushrooms, roast peppers, steamed potatoes and a peppercorn sauce and then strawberries with cream and a homemade chocolate sauce to finish. So we have been well walked and well fed! The foodie post will be up soon – most likely Monday as I’m away this weekend. What else? I attended my first hypnotherapy session last night. I’ve spoken before about how I really want to be Merry and healthy. A big barrier in this is my food aversions. I haven’t eaten fruit and vegetables as far back as I can remember. Mum claims I used to eat brussel sprouts when I was 3 but I cannot remember. It is something that I really want to change but I just find myself unable to swallow when I try to eat these foods. So I’ve decided to get some extra help. Whether it will actually work or not is still unclear but I really think it is worth a try. I’m worried this post is already a long post so I’ll finish up for now and save the details of my hypnotherapy experience for later. I hope everyone has a jolly weekend, I’m off to visit family on a flying visit which will be nice. Cheerio for now! Todays thought is quite long but finance isn’t much of a lightweight topic. Listening to a discussion about mortgages on the radio on our way to work has me thinking about our finances. We are planning to rent for the next two years until Boyo gets his permanent contract so we have time to save for our next mortgage. * And what are we actually aiming for? I’ve got a lot of ideas buzzing in my head about becoming more frugal. * My cooking – but still aiming to be both delicious and more healthy. * Our hobbies – that is actually easy as the boyo and I like nothing more than wandering the great outdoors. * Travel – we’ve already booked an expensive holiday to Hong Kong but our other jaunts could me UK based, short camping weekends. * Challenging myself to become more fit and healthy so that I once again fit into more of my wardrobe and experimenting with what I have rather than buying anything new. I think keeping better records of expenditure will help me to see where I could make potential savings and appreciate what I have more. And lastly, what are we aiming for? Do we want a big house with lots of space? Or do we want somewhere that looks fantastic? Is the postcode important? These are interesting questions and to answer properly we really need to think about our future, a family? pets? I don’t think the Boyo and I have grand or fancy ideas, after all any house can become a home with a bit of care and attention. What are your thoughts? How do you budget? What are your priorties? Thinking about all of this makes me feel terribly grown up, it’s not wonderful that so much revolves around money and whilst winning the lottery would be fantastic I think the important thing is to value what you ahave and embrace simple things which can lead to so much happiness. For me a walk in the fresh air with the Boyo is simply one of the best things around.